SUMMARY: In which TMH, sans dogs, strikes out across the suburban wilderness to see a film. So, after the other week, where the Sierra Club went for a really brisk "hike" of 5+ miles, all on paved walkways in the suburbs of Palo Alto, with some folks snapping photos left and right, I thought--hey--let's take a new view of my own neighborhood as a Hiking Destination! But when to do this? Photo snapping isn't the easiest with Tika and The Boost on leash. Saturday morning I agreed to meet my sister and bro-in-law at the mall to see Iron Man. (Good film! If you like films like this one! I enjoyed it, and I was a DC, not Marvel, reader in my misspent youth.) I always drive because it's a LONG way over there--gosh, at least 5 minutes, or maybe less! But then, Saturday turned out to be a gorgeous day, and I realized that hiking 1.8 miles each way to the mall was a whole lot less walking than I've been doing Wednesdays with the Sierra Club. So, what the heck! Have camera, will hike. So off I went. Here are some things that I wouldn't have seen if Tika-meister and The Booster had gone along. I don't know what this feline had locked her gaze upon, but she didn't twitch the whole time I stood there and snapped photos. Mr. 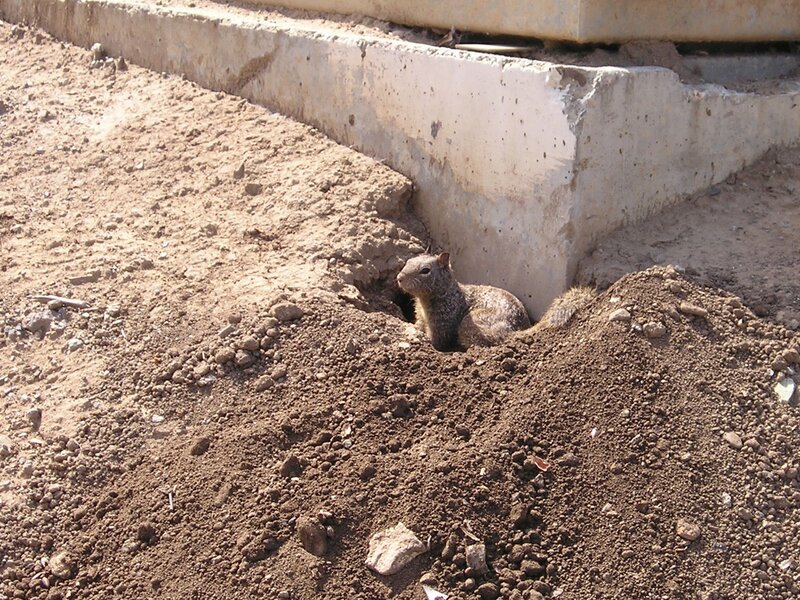 Ground Squirrel doesn't care that he lives in the suburbs instead of some ugly dusty field somewhere. In fact, he's got a great deal: His entryway is that Soviet industrial block-concrete look that I've seen in so many office buildings around here. He's the envy of all his neighbors. Oh--wait--he doesn't have any neighbors. Wonder where he finds a date? Ooooh nooooo! I have to give The Boost to Kiara or she won't graduate! Noooooo! I won't do it! I won't! She'll have to get her own Puppy! All the rest of the photos, plus attempts at witty commentary, here.